Website designs can be found easily for news sites, for artists, for photographers, for sports magazines, for bloggers, for vloggers, for kids, for elders. But when it comes to the medical profession, there is nothing available out there. If you are a practising physician or dentist, a manager for a clinic or a hospital and have tried to design a website for your profession, you know how difficult it is to get a medical WordPress theme that is informative yet simple. This is why MedicPress, a WordPress theme was launched for the medical profession to create simple websites that caters to the needs of the industry. At the outset, MedicPress is a WordPress theme for medical professionals who want to make exceptionally good looking and informative websites for their visitors. Designed exclusively for medical professionals, it includes the common and most essential services and functions of their day to day work. But if dig a bit deeper, you will find that MedicPress does much more and is essentially a turnkey solution for medical professionals when they are designing a website. This WordPress theme has been designed after in-depth market research and innumerable hours of development and testing. Therefore, the websites using this theme look extremely professional and trustworthy, just like the doctor, the website is being made for. 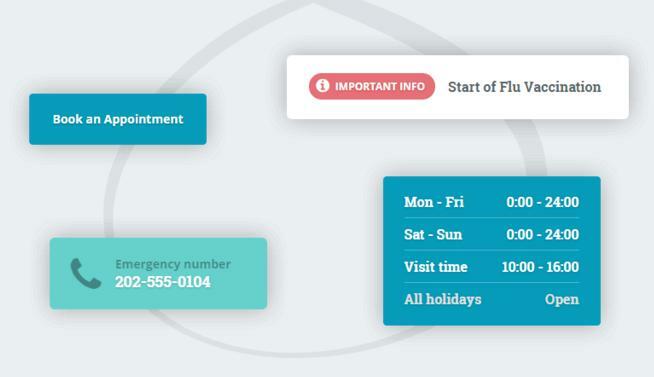 Most important bits of information for the patient such as clinic timings, doctor profiles, and emergency contact numbers are easily visible to visitors on these sites. 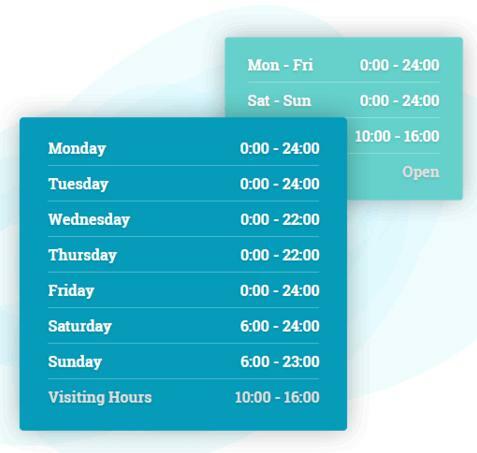 Even if there are multiple doctors in the clinic, MedicPress can work its magic and show specific timings for each doctor. Unlike other themes that can be off putting for patients, MedicPress has a modern feel that is welcoming and radiates safety. Using custom made medical icons and standard icons, your website can give off lots of information to the patients, who are looking for it and that too in a hurry, saving them precious time. 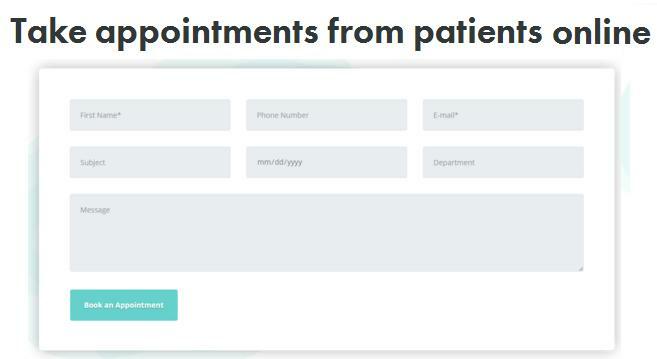 Patients can also simply book appointments through the site itself. So, there is no need to dedicate a person to give appointment for various doctors at the clinic. Not only does MedicPress make an impression on the patients, it makes an impression on search engines too. It is one of the very few business oriented WordPress themes that have received green badges from search engines for its speed and robust performance not only on desktops but also on mobile devices. What this means for your site is that not only will load faster for your customers, but it will also rank higher in search results ensuring more potential visitors to your site. Running a successful clinic not only requires multiple doctors but also multiple departments. More doctors and more departments also mean more information on the website that can make it cluttered and confusing. MedicPress address this issue of sorting information with specially designed dropdown menus that stack up beautifully on the website revealing information to those who seek, when they seek. This medical WordPress theme also works in 14 popular global languages. Translated by expert professional translators, MedicPress can work for you in your local language not matter where you are located in the world. Also, if you need any help, all necessary information is documented for ready help, whenever you need it. An important feature of this theme is the one click demo import (OCDI) support function. If you are not an advanced user of WordPress, the OCDI functionality on MedicPress ensures that your website can be up and running in no time. All you need to do is click on the import button and your website change within a minute or two to the new theme. 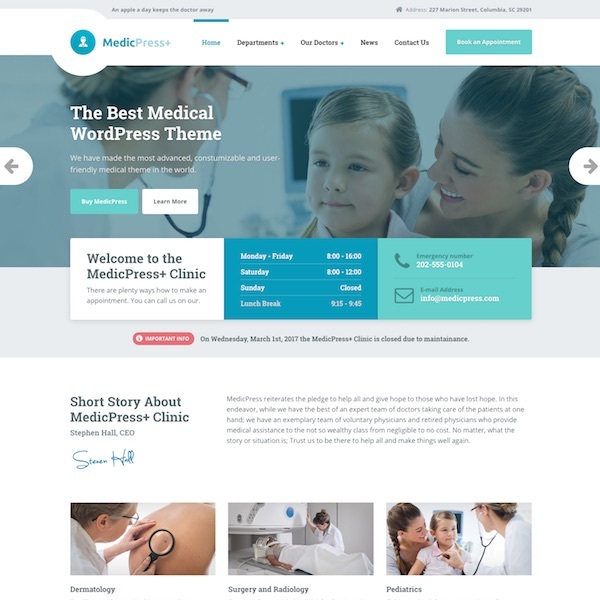 Delivering advantages for your patients as well as your business, MedicPress is the ultimate medical WordPress theme you have been looking for. These excellent features can be part of your website for just $59. This is just a one-time fee and makes you eligible for priority support and free updates for all bugs for a year. Yes, developers of this WordPress theme, Proteus Themes, strongly believe in delivering answers to your queries in hours rather than days and have managed to do so for over 9000 tickets. MedicPress is a unique offering for the medical community, who until now, had to make do with themes meant for other businesses. Designed and built for clinics and doctors, MedicPress can help clinics scale new heights by being found in search results, delivering necessary information at the right time and confirming appointments without any hassles. For a small fee of $59, MedicPress is a steal and should be adopted by every clinic to gain visibility in their local markets.